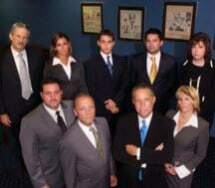 Our firm was founded in 1983 by us - Todd Greenberg and Dominic "Buddy" Addabbo, two former Assistant District Attorneys. Today we are joined by additional attorneys, a high caliber support staff and we utilize extensive technology to achieve notable results for our clients in the areas of Criminal, Personal Injury, Real Estate and Family Law. We are the industry leader in turning legal experience and personal commitment into positive results for our clients. Addabbo, Joseph P. Jr. Esq.